I wrote briefly on de Balincourt in 2007, but that was just to place him within a broader stylistic context. Back then he showed with Zach Feuer, and unfortunately my links to the Feuer site for illustrations are now void. I still plan to replace them, sometime. However, five years on finds the artist in his fortieth year, more or less mid-career, with some impressive auction figures and perhaps due a more detailed appraisal. This article does not so much revise my earlier one as expand on the artist’s development within the framework indicated there. The artist’s current show unfortunately has drawn little in the way of reviews and where it has rated a mention the tone is distinctly weary and condescending. To some extent this is a consequence of surviving in a hothouse like New York, where, as with much else, familiarity breeds contempt. Then again it is understandable given the gradual softening or relaxing of his style and themes that make the recent work less acute, less challenging. Undeniably the artist has mellowed, but this has allowed new depths and sophistication and these are to the fore of the current show, Ecstatic Contact. While bereft of critical response, the show has nevertheless an informative You Tube courtesy of faithful fan James Kalm, as with previous and affiliated events. 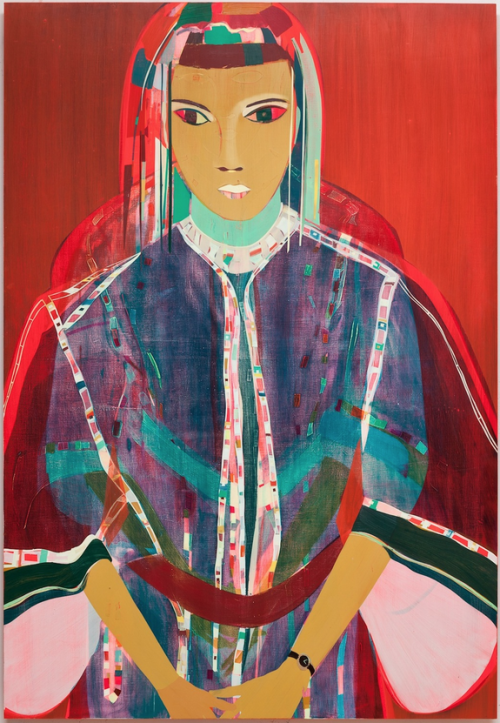 There is also an excellent interview with de Balincourt on artnet. The artist’s candid remarks across these sources, on a slacker aesthetic, suspicion of abstraction, working methods, ambivalence toward group activities or sub-cultures, global politics and mysticism, all suggest promising avenues with which to approach not just the current show, but the whole of his work. For, given the diversity of subject matter and prolific output, a wholistic or structural approach is perhaps appropriate. Admittedly this is only done online here and mostly via the artist’s somewhat flawed website, nevertheless several underlying themes emerge. The first works to achieve recognition were a series of maps titled U.S. World Studies between 2003 and 2005. Here the outline of mainland America served as a template for accommodating foreign and domestic states, implying a blithe imperialism and indifference to geography. 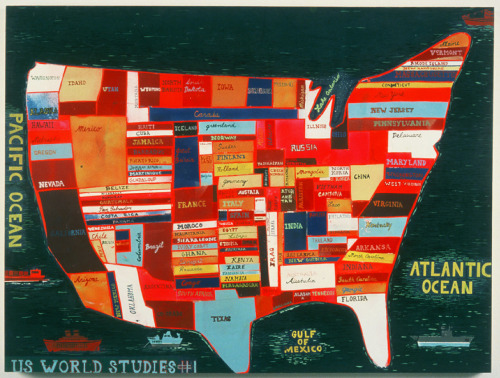 The use of a map of the mainland inevitably recalled similar maps by Jasper Johns and the comparison is helpful in pointing to de Balincourt’s thinner, more deadpan facture, laboured script and lettering, in stark contrast with the commercial stencils and loaded brushwork of Johns. Where Johns constrains an expressive urge through template and familiar map to find an intriguing balance between compliance and contempt, de Balincourt stresses something closer to an outsider or naïve signage, ‘indie’ or agit-prop graphics. It is largely these overtones that lead some commentary to attribute such features to the artist’s French background, although he migrated to the U.S. as a child. The works are then seen as a way of distancing himself from standard identifications, as a cultural rather than political statement and there is something to this reading. Indeed, it is part of what makes them richer than say, merely the errant detournements of a west coast flake (a view sometimes harboured in France, ironically). But Johns need not be the only point of reference here. The maps also evoke Alighiero Boetti’s commissioned embroideries from the 70s through to the 90s, where the flags of nations fill their map borders, generating curious breaks and continuities of colour and shape between neighbouring nations and fascinating global echoes. 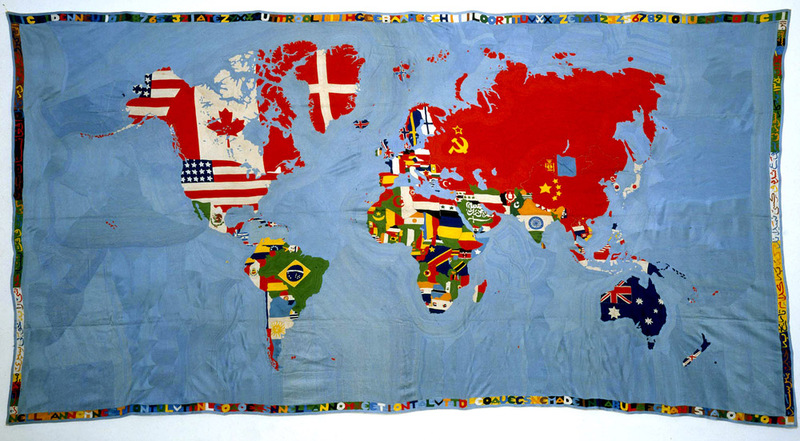 Boetti gives his maps titles like Game Plan (1971-2) and Order Disorder (1990), urging a sceptical, ideological interpretation to flag design and map agenda. His maps were commissioned from refugee and third world female workforces and carry a deliberate folk craft or amateur aesthetic that underline their disenfranchised or outsider perspective. 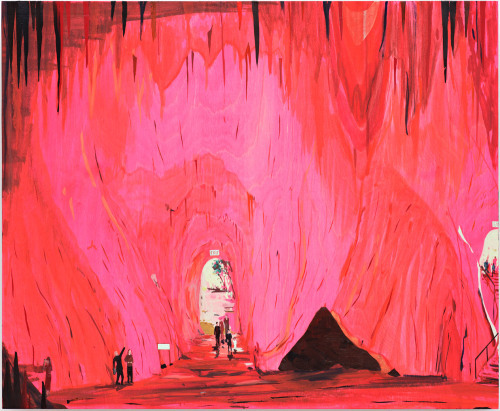 This is something shared by the technique in de Balincourt’s early work. Actually, the vertical lettering to the borders of Boetti’s maps particularly recalls many of de Balincourt’s more diagrammatic or map-like works. 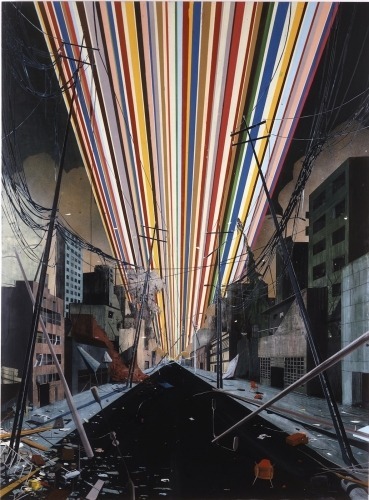 This is not to suggest that de Balincourt was directly influenced by Boetti, but rather to indicate precedent for a provocative global perspective allied to amateur or outsider treatment, irrespective of artist’s psychology or background. It is also significant that de Balincourt was initially a student of ceramics, hence well aware of craft options and their standing to fine art. While the maps gain de Balincourt wider recognition, from the outset his work covers an array of subjects and treatments, some more or less diagrammatic, some reducing social practice to a toy or model-like rendering, later, literally models or toys granted broader metaphor. Around the turn of the millennium there is considerable artistic interest in charts and diagrams, not only for their pointed social content, but as pictorial abstractions or formal devices. 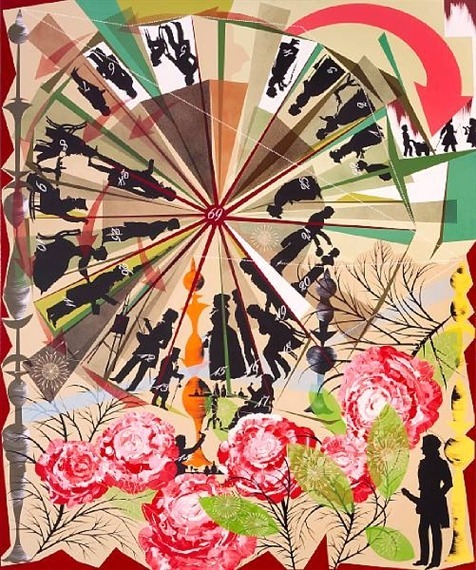 Artists ranging from Lari Pittman to Franz Ackermann, Mark Lombardi to Fred Tomaselli all variously draw upon graphics for spatial metaphors, can invest these with greater formal elegance or complexity or test extension to the literal or concrete. For de Balincourt these issues particularly invite more concrete models and surprisingly find application to recreational activities. 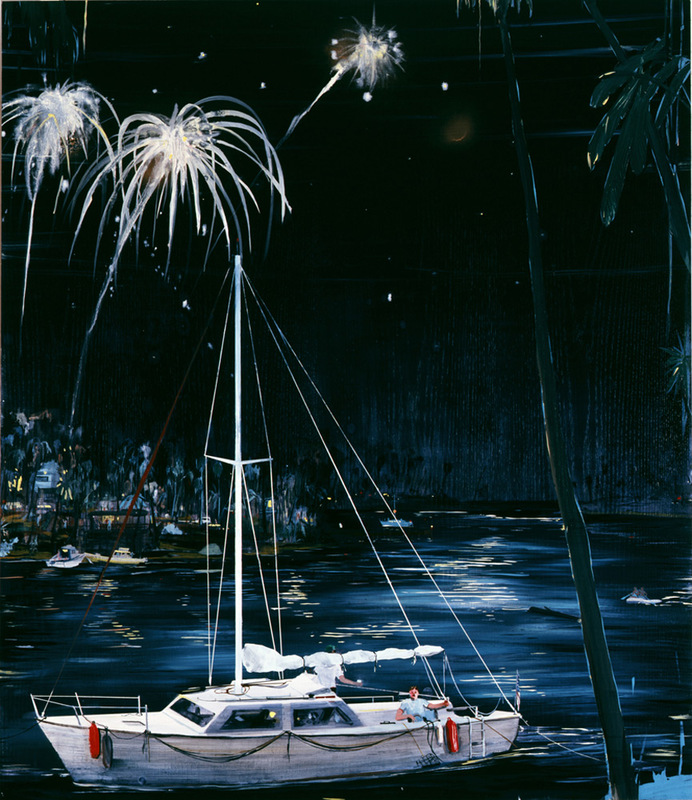 Given the political tenor to his maps, one might expect more figurative work to then detail exploitation or oppression under the Yankee jackboot (New Found Land (2004) is a possible exception), but early scenes tend to concentrate on resorts and absurd conformities. Works such as Gathering (2003) and Human Resource Center (2003) illustrate not so much scenes of oppression as obscure or counter-cultural rituals. There are works such as Feast of Fools (2004) and The People that Play and the People that Pay (2004) that certainly deal in decadence and exploitation, but the underlying theme becomes one of uncomfortable communion or conformity. And as the artist invests more detail and three-dimensional rendering in such scenes, they become uncomfortable on a technical level, no longer strictly an outsider’s terse graphics nor yet a professional illustrator’s polished stylisation. Treatment of figures and vegetation fall unhappily between stools while architecture achieves smoother transition. The artist’s gears grind and discomfort registers but not in a good or meaningful way. Other works picture skiing resorts, white water rafting, open air concerts, scenic caves and massed moped tours (the latter something of which the artist appears to have had firsthand experience). The emphasis on recreation goes beyond simply targeting a leisure class. Conspicuous consumption, luxury travel, wastage and obesity might more usefully have flagged this segment but find no place in the artist’s work. Instead leisure takes on a certain bleak detachment, not simply idyllic holiday spots or moments of recreation, but a brittle escapism, a resistance to greater attachment or employment, that ultimately lacks conviction as well as technique. 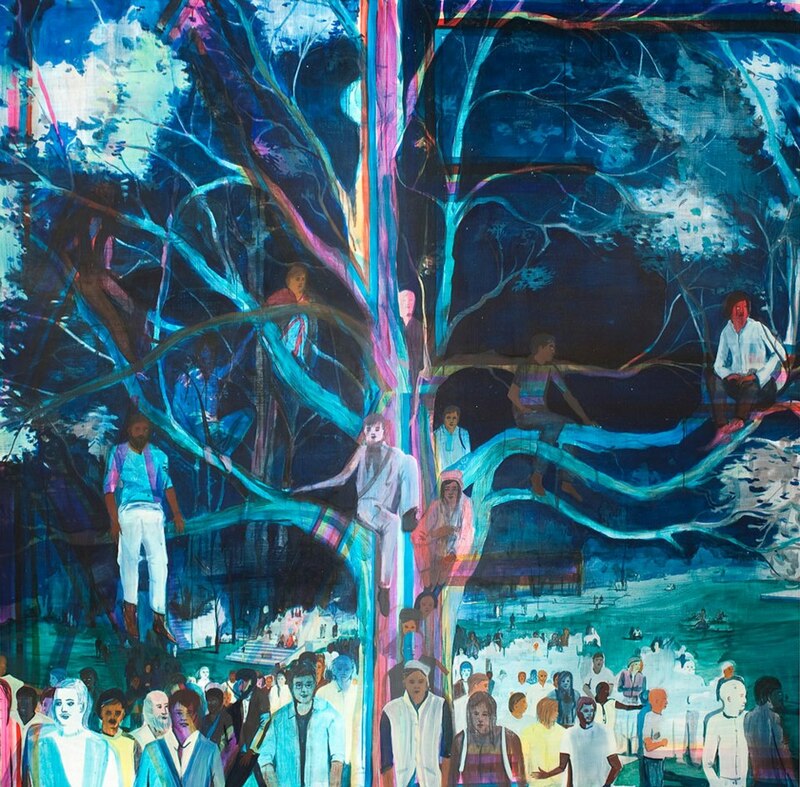 A comparison with early Peter Doig is helpful. Where Doig enshrines holiday photographs of fleeting moments of excitement or contemplation in rough tracings, shimmering fillings, de Balincourt reports from above, in cursory terms. 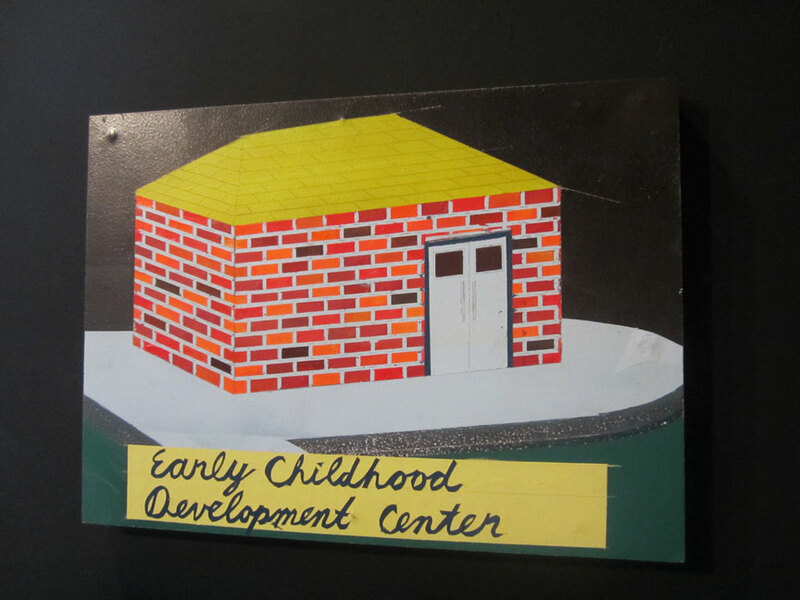 They are more like crudely rendered postcards that no more than denote an activity and key geography. The message is remoteness, not just from work or people but pictorial conformity. Again, the artist’s background perhaps suggests a reluctance to fit in or integrate that is at least held in abeyance by holidays, grants the splendours of nature there some brief consolation. It is by any measure a novel expression of such alienation. 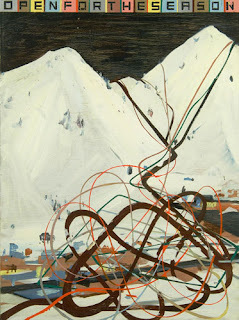 But once one allows the recreational pictures this theme, de Balincourt’s more schematic efforts soon inherit it, so that as the artist struggles for a bigger picture than holiday destinations, the terms turn abstract or over-expansive. The maps and diagrams are then sweeping policies to deal with wider implications, schemes that connect the global to the local, the bits where the artist must somehow find a home, go to work. As noted, this ambivalence is finally part of what gives the work its distinctive attraction. Works oscillate between condemnation and justification, can see the grand plan only by compromising the details, or need a grand plan only when troubled by the details. Yet who amongst us has all the answers? The artist swings wildly between extremes, but in a reassuring, open way. If he finally proves shallow or inept, there can at least be no doubting his sincerity. 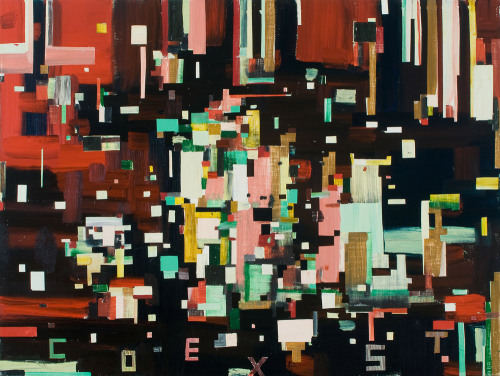 One might of course, regard the artist’s overall output as simply so many unconnected forays, as impossibly diverse and plural. But this is to trivialise the themes and exaggerate the claim of capricious dabbler; unjust given the sheer volume and consistency demonstrated. No, the artist regularly stands back from it all, to be sure, but misses the detail where he fits in, scorns more expert or respectable technique, but sooner or later needs it for a more convincing picture. It is the reconciliation of these demands that gauge the artist’s development. Interest in diagram often supposes a comic strip approach to the figure and for some of de Balincourt’s contemporaries this sanctions South Park or Manga-like inspiration; enormous eyes, vulnerable or infantile bodies, a painfully false sentimentality. Surprisingly, the artist is not tempted in this direction. Early figures such as Youth Nationalism (2003) draw on less obvious graphics. The flat stencil or masking, silver leaf or metallic paint and restricted colour range, all announce routine signage, a comfortable icon or avatar for the model cadet. But like the early landscapes, the surface is often abraded or distressed, giving the works a used and abused feel. It is the surface above all that distances them from print sources and adds to a forlorn, slacker attitude. Understandably, early figures are often military - befitting militant maps. However, by Poor Vision (2005) the surface is less noticeable than the improbable camouflage colours to the general’s fatigues – presumably the point of the title – given his all-green surroundings. But the figure is also much less of a convenient icon than Youth Nationalism and while the drawing probably derives from a photograph, tracing is not foremost to the presentation. A preference for line over modelling, for more or less flat and few colours and an uncertain degree of simplification register not so much as an outsider’s slack skills as an indifferent middle ground. The work suffers, but also marks the artist’s tentative steps toward a more sophisticated approach to figures. 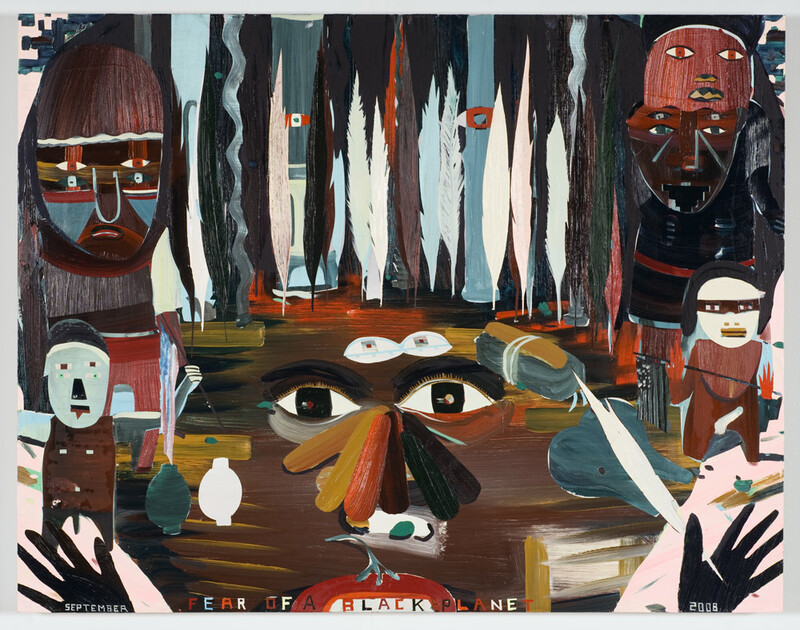 The person is prominent in two other important ways for de Balincourt around 2006-7. 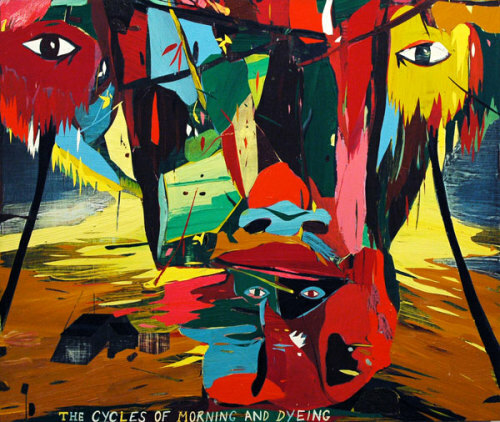 There are firstly personifications, such as Cycles of Morning and Dyeing (2007) where a makeshift rack of clothes or rags drying on a beach acquires eyes, nose and mouth, in some ways as disguise or camouflage, in others, as diagram or schematic arrangement. Here the theme of all-embracing diagram versus holiday retreat plays out on a personal level, the person as either rigid or ragged schema or eccentric beachcomber lifestyle. Either way we scarcely grasp a person, hardly befriend the arrangement. 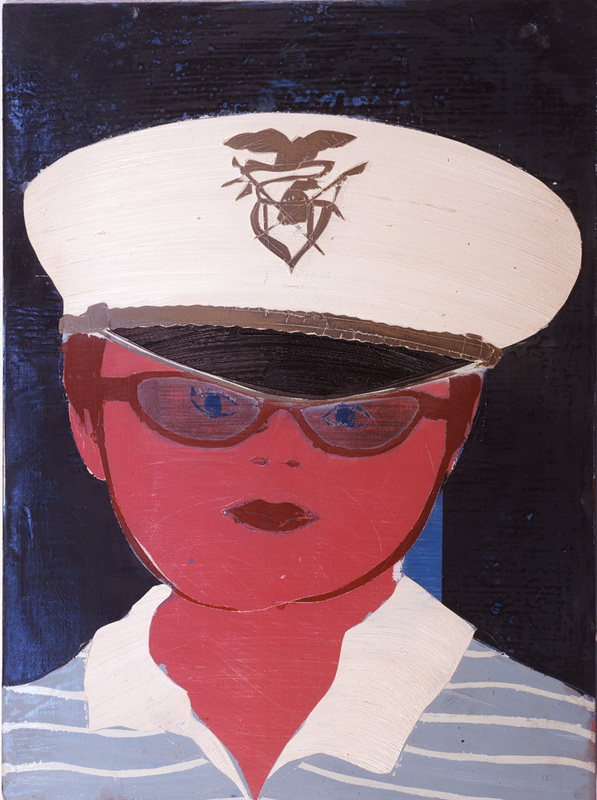 Other works, such as Violent Peace, Violent Healing (2006) more subtly insinuate a face or mask into stricter schemes, slyly assign a personality to the diagram. 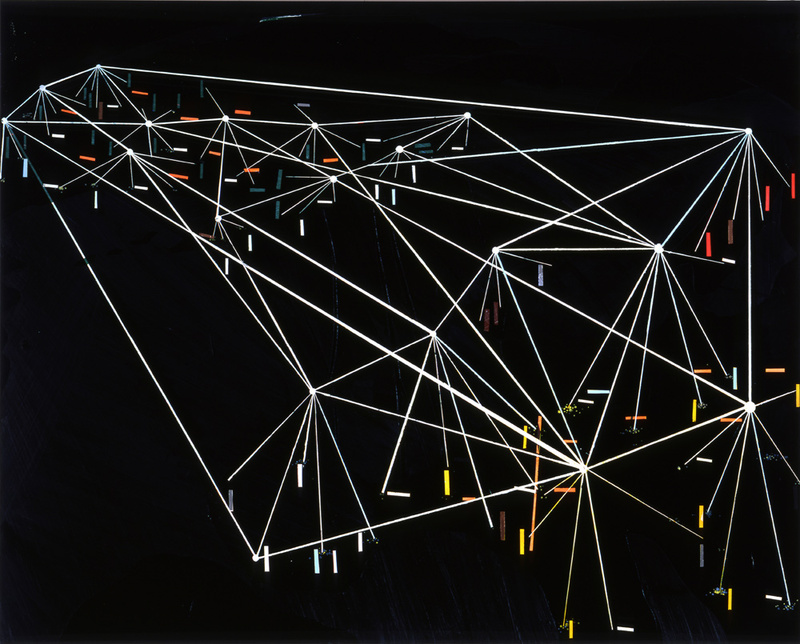 Again, such works as Island Hoppers (2006) show how the themes intersect, how apprehension of person is also caught up in the need for comprehensive diagram or distant leisure locations. There are secondly pixel-based or digital motifs that obscure or disguise a person. These also seem to arise around 2007 with a work such as Holy Arab (2007). Here a radically low resolution image of a bearded Arab barely registers as a face, while a superimposed outline traces vaguely around the eyes, indicates other arbitrary points to the diagram. The person here simply eludes focus or proper recognition, as for example, Osama Bin Laden may have done at that time. The reverent yet stereotypical title toys with this more elusive, conclusive identity, acknowledges a lax diagram, perhaps poor search engine. The theme of an elusive or unfocussed identity is developed further in The Eyes of the Fortune Teller (2010). 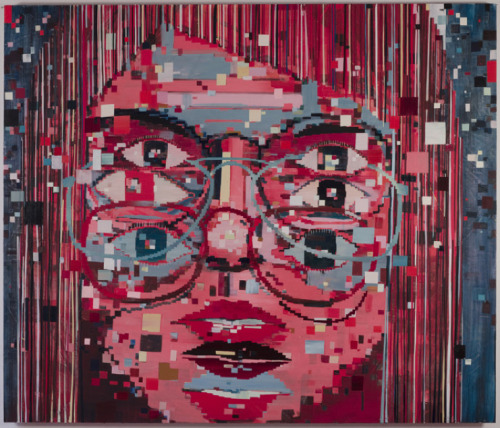 But while the vertical slippage between sets of eyes, together with pixel breakdown here recalls server or browser fatigue, and implies firstly a foiled or teasing web contact, the same doubling of eyes appears earlier in the small work Fear of a Black Planet (2008) independent of pixel motif. In other ways, this evasiveness is caught in simply looser handling. In Boys Club (2011) sketched outlines, layered glazes now deliver an unexpected sense of process, of overlapping and provisional concerns, an informality in tune with the implied intimacy of the title, yet at odds with the group pose and surrounding wall of traditional portraits. On screen the work looks no more than a sketch, yet it measures 178 X 203cm. Size only serves to highlight this newer, lighter touch. Admittedly the work does not as yet achieve any great distinction by this relaxation in style, perhaps nods to Dufy as much as Matisse, but now marks an artist availing himself of far greater painterly resources. In subject and style, he now cautiously approaches insider status. The French connection is hardly coincidental. Both this doubling of features and looser, layered handling are pursued more effectively in the current show. The full array of the artist’s subjects is represented, but now offers greater cohesion or consistency. Pangea (2012) is a hypothetical map of earth’s ur-continent, when all landmasses were joined. The personification here thus presents an elemental community, yet tellingly, along the emerging fault lines the separating landmasses are identified not with a simple or single face but often two or assorted parts. The person again is strangely evasive, perhaps best seen as a couple or multi-faceted. For all the stability announced by the subject, the personification stresses fragmentation, at best a temporary co-dependence. The oceans filled with shipping are an amusing anachronism, but busy sea lanes have been a recurrent motif for the artist from his first U.S. World Study. The mobility offered by the sea - or any water really - is often contrasted with the conformity and clutter of land, both in the treatment of its shimmering surface, unusually nuanced, even from the start of the artist’s career, and distant, touring fleets. Also in the show, Itinerant Ones (2012) underlines this freer, nomadic life while in Jimbo’s Jamboree (2006?) it is evidently the source of celebration. Landmasses, then, may be just a little slow in gaining independence or individuality for the artist’s liking. The person as compliant group member, reluctant or hidden individual is similarly explored in Off Base (2012) where a group of soldiers pose, much like Boys Club, but here on active duty, perhaps on patrol. While the initial impression is of uniformity, after a while their overlapping, layered treatment begins to undermine the pose, to allow parts and persons to float free, to be not entirely there or focussed. It may be a drugs thing. It may be that they are simply the incarnation of F-Troop. Significantly, the front row of kneeling figures clusters into three couples, as does at least two of the back row. More feminine eyes and mouths are soon discerned. As with Pangea, a seemingly unified group dissolves into smaller cliques, private agendas. Any united front they might present quickly becomes wishy washy, unfinished, insubstantial. And this is surely the point, given the subject, just as the title plays upon their location beyond safety or scrutiny, as well as wide of the mark. Pray these people don’t have your back. Tangiers 1912-2012 (2012) is perhaps the most surprising and effective work in the show. Here too we have a subtle doubling to the eyes, shoulders and sleeves of the girl in Moroccan costume. So that even when treated as an individual there is a curious incoherence or ambiguity, not brought about through motion or circumstance but permitted her by the artist as a symbol of some greater personal depth perhaps, or the artist’s own insecurity. She will never be all there for him either. But the doubling here is extended through the painting’s deliberate citing of Matisse’s Zorah on the Terrace (1912) in the title - a larger image, but in a much larger file, is available here. The artist now is confident enough to openly restate a work firmly from art history and by a French artist. It shapes as an almost oedipal moment. His own style, with its translucent layers and crisp linearity receives its sternest test and emerges a little more traditional for it. The artist may have moved in a little closer and given her a wristwatch, but a hundred years has made her no less inscrutable, has only made him more of an insider. 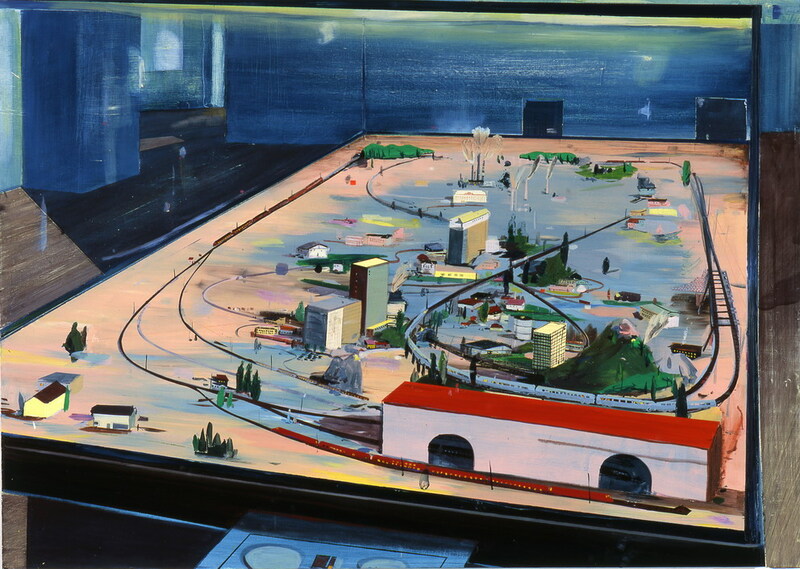 De Balincourt’s schematic side is exercised mainly in Ecstatic Contact (2012) the work that gives the show its title. Here the vigorous network of straight lines does not map ideological forces so much as spiritual ones. Crucially, the network now links people directly, even physically – is emphatically a ‘hands on’ affair. The energy here arises simply through an enclosed community or network, would seem to grow more ecstatic for greater participation. Fluorescent paints and spray stencils remind us however that base means are no guarantee of lofty ends; signal a less than ecstatic contact with drawing or iconography. Related works, such as Illuminated (2012) are less metaphorical, are part literal fireworks, part diagram for aspirant spiritual communion. Notably, these arc across a moonlit fleet, admit a more organic curve. 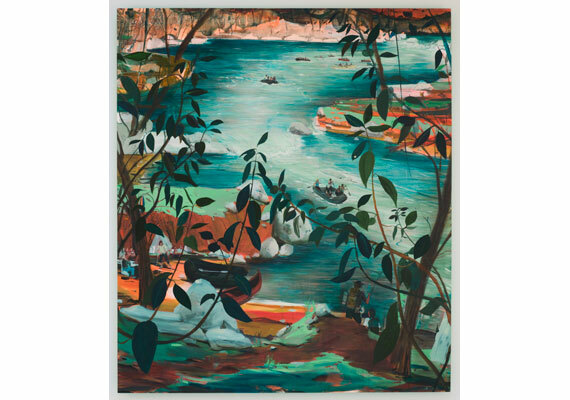 The distant view from above is also revisited in Idol Hands (2012) where de Balincourt’s lighter touch allows a more satisfying integration of figures, foliage and architecture than previously. Indeed, perspective is happily jettisoned to middle-ground buildings in favour of a carefully harmonised colour scheme. But Idol Hands is really about a generic city park where people come to demonstrate favourite causes with no great excitement or regimentation. Essentially it pictures another quirky conformity viewed from on high. The point lies in the banners that are portraits of various individuals but lack any obvious linking cause. In effect tiny people promote slightly bigger people but only to other tiny people, most of whom have their own banners. Again the issue of identity idles beneath these ineffectual hands, as it does with the surrounding white statues of historic figures, all blank at a certain safe distance. 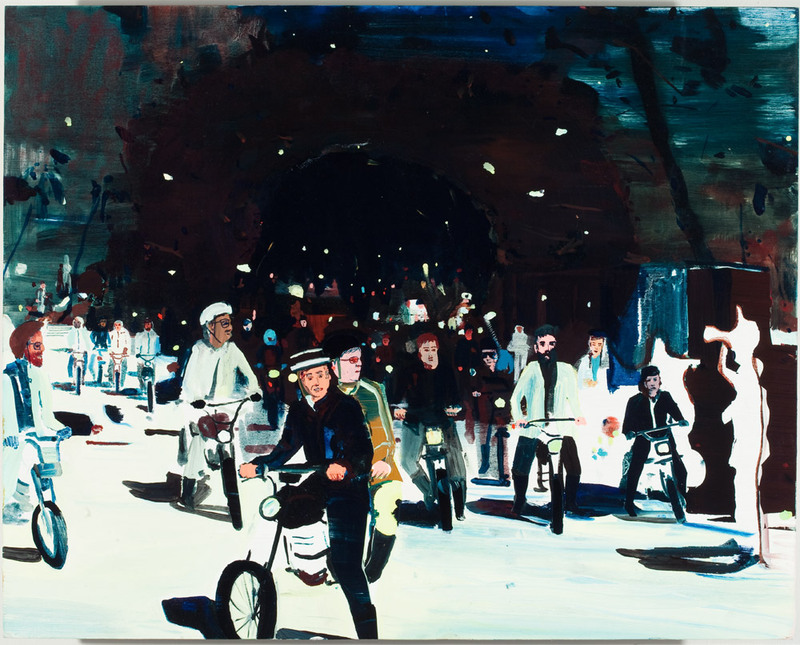 De Balincourt is unlikely to abandon these key themes to his work since each reinforces and enables others, as this article has tried to demonstrate. There are pictorial and personal commitments at stake. The artist’s maturity can build on these, perhaps divide and articulate them in new ways, but at this stage the roots and routes are set. Subsequent work may well find more intermediate or hybrid examples, knitting the themes together more elegantly. 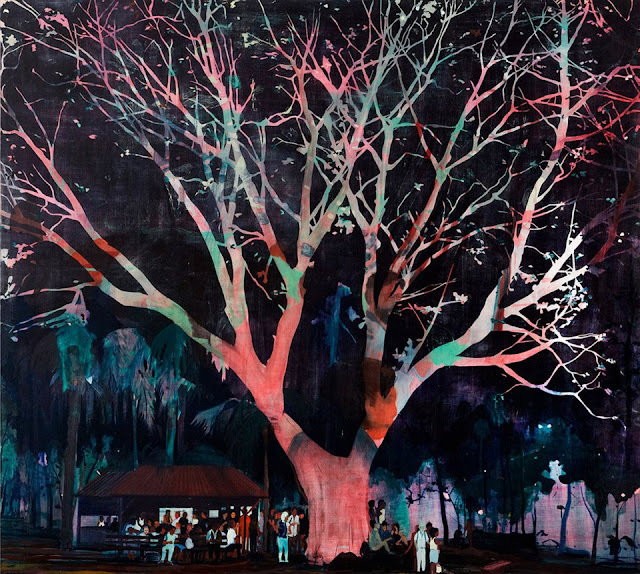 Some examples not included in the show, are recent paintings of a large tree with a crowd beneath or perched upon branches, to observe some passing spectacle. Here the artist’s more layered handling allows intriguing pentimenti, declares a new elegance in drawing and while recording another curious crowd conformity, subtly suggests a family tree, another diagram of vital relations, another symbol of growing stability and identity. These too appear to be in parks, are essentially scenes of leisure or retreat. But the crowds are now handled with a new discretion and confidence. The artist may lose some earlier admirers by these more nuanced developments, but he will surely find others for them.